Supports side-mount tool changers. During tool change recovery, the arm may be moved a small amount by pressing the ATC FWD or ATC REV key. Each press of the key will cause the arm motors to run for the amount of time (in milliseconds) specified by this parameter. 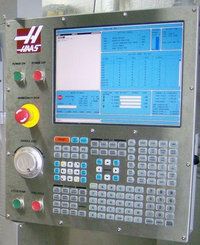 For mills without a side-mount tool changer, this parameter should be set to 0. On horizontal mills with a side-mount tool changer, the arm may be rotated a small amount by pressing the End or Page Down keys. The shuttle may be moved by pressing the Left Arrow or Right Arrow keys. Each press of the key causes the motor to run for the amount of time (in milliseconds) specified by this parameter.